L'Oreal impressed me in a great deal in 2013 with their Colour Caresse Wet Shine Stain range, and continues to do so with the new Colour Riche Extraordinaire that came out recently. 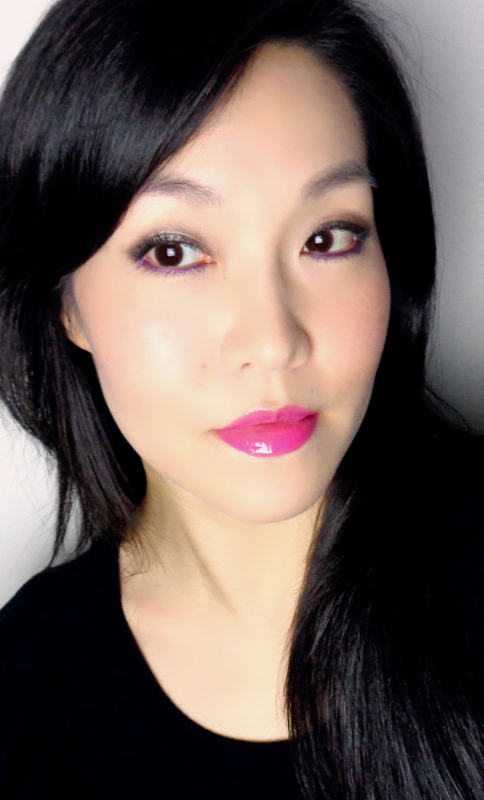 I am buying far less drugstore makeup lately, but I have this feeling the Pink Tremolo won't be my last Extraordinaire. Transform lips from ordinary to extraordinary. Color is richer, lip surface is smoother and shine is magnified. Formulated with precious micro-oils and rich color pigments, Extraordinaire provides the ideal balance of color and care for perfect lips. The unique soft-touch applicator allows for a silky-smooth, gliding application. I am not a big fan of the bling-y gold packaging that attracts finger prints like crazy, but I must hand it to L'Oreal since it still succeeded to capture a high-end feel and simplicity. Besides, lets not forget we have the same problem with some of the Yves Saint Laurent lippies. I have no real complaint here. The tube is rather chubby and comes with a short fuzzy applicator. Compared to the Colour Caresse Wet Shine Stain applicator (on the right), it is not as angled but slightly bigger and fuzzier. 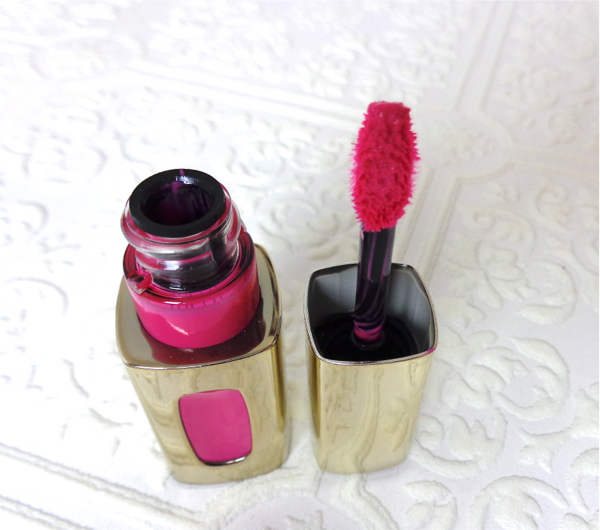 Extraordinaire Liquid Lipstick applicator performs very nicely and it feels great on lips. The color is distributed very evenly ensuring a better wear. Pink Tremolo is a creamy hot pink. The color is quite intense and pigmented. I would have to experience other colors from the range, but at least Pink Tremolo lives up to its "Liquid Lipstick" definition. Very even opaque coverage with no blotchiness. It feels slightly thick yet very comfortable on lips. The finish is super shiny as you see in the swatch picture. If Colour Caresse Wet Shine is a perfect happy medium of stain and gloss, Colour Riche Extraordinaire has achieved the same of lipstick and gloss. I did not expect it to last for long on my lips but surprisingly, it does! The color lasts on me for about five hours with normal drinking/eating and talking, and it fades away naturally. More impressively (and importantly), my lips stay soft and supple even after the color is gone. 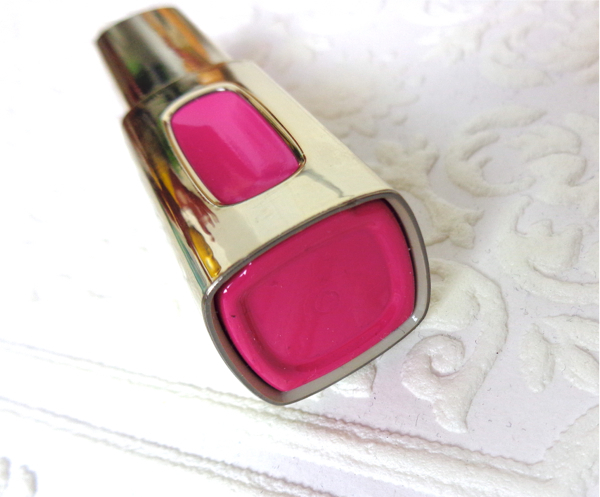 It has a somewhat strong fruity fragrance which I don't mind personally, but it is something to consider if you are sensitive to scented lip products. I have read reviews that Maybelline Elixir is comparable to Colour Riche Extraordinaire, which is another thing worth considering. Have you tried Colour Riche Extraordinaire? GORGEOUS shade! But it's so glossy and shiny! I'm not a huge glossy look person, so does it dry down a bit after awhile? We know we both love pinks like this! I still haven't tried the liquid lipsticks yet but have definitely been meaning to. The colour looks beautiful for you! And five hours worth of product is extremely good! I don't have much experience in liquid lipsticks either, but this would be a good start. They are relatively affordable and good quality! It's surprising that it lasts 5 hours including food and drinks! I would never have thought something that looks glossy to last that long considering it's not marketed to be a stain! I remember the review on Catrice! We have so many nice drugstore lippies nowadays. Higher-ends shoudl ante up! Yes, I was pleasantly surprised as well. I'm not talking about fried-chicken-wing-eating here, but still it is impressive. LOL. I am usually less attracted by gold finish but this is simple enough! Hey Lena, wow, what a stunner! It has such a beautiful glazed finish, and the color is very vibrant! Looks really good on you! Oh this shade looks beautiful on you, Lena! I wish I could pull off pinks like this. I've been reading quite a bit about L'Oreal lipsticks but I never try them because I can't stand the scent. Every single L'Oreal lipstick I tried had a particular scent that I just can't tolerate, so I don't even try anymore. Pity, really... this one sounds particularly lovely! I agree the classic Colour Riche lipstick smell makes me queasy and even the Colour Caresse Lipstick smell bothers me a bit although I love the formula. this looks amazing and i really really really want to try this product out. i'm also glad you compared them to the caresse wet stains b/c i have one of those and was wondering how they different. also, like you, i love that the names are music/composition related. i think it's so classy and reminds me of the symphony hall i use to go to for school field trips. i'm defs lemming these. Being a musician, I am so happy to see color names like this. the shade looks so pretty on you. I always thought this type of liquid lipstick wouldn't last which stops me from buying. 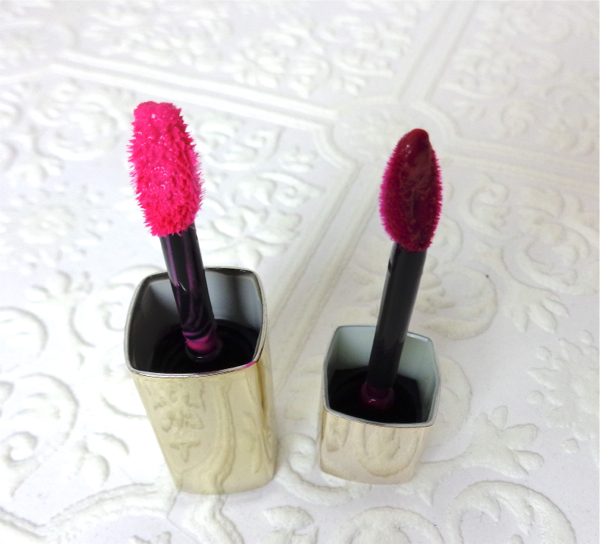 I have a couple of the Loreal color caresse ones but they don't last long on my lips and they have a certain scent which I am not crazy about. Will have to check this out and see if I like the scent. Wonder why they like to put such strong scents to lip products. I totally agree there is no need for strong fragrance in lippies!! Eeek, so pretty! Is it sticky? I want to try some! 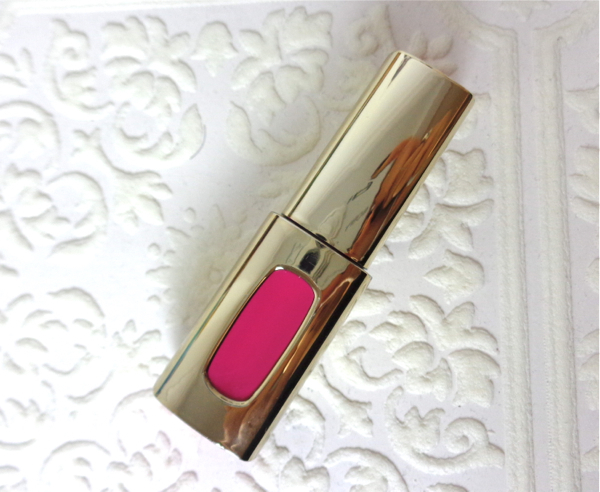 That looks fabulous on your lips (color and how it sits)! The only problem with Loreal lip things are the scent for me. Luckily for me, I don't mind the scent but I myself would have liked a lighter or no scent. Totally unnecessary. OMG this looks freaking amazing!!!!!!!! UGH LENA. Ohhhhh you are certainly tempting me to go buy a couple to try. This color totally was made for you. So pretty! And the texture and formula looks promising too. Thank you! I love pink like this a lot! It is a stunner and the formula is really comparable to higher-ends, imo. Oh that's one hot color and you rocked it! Amazing finish and color! Holy! These are sooo sooo glossy! I really love the gloss and the color! I haven't been buying or looking at any drugstore make up recently so I need to see if we have these! This shade looks amazing on your complexion! If you love gloss formula, I think you'd like this one. It is on a thick side but feels very nice on, too. That color honestly scares me a little but it looks amazing on you Lena! Haha. Yeah, I love pink but this one is quite loud. a very hot pink but oh so pretty, Lena! So, this is the colour that you sported in an Instagram picture! Maybe it is already over there. Many times asian countries get the new collection faster not to mention that you get cuter stuff! Wow, what a gorgeous colour! I'm a total sucker for hot pinks. I don't tend to pick up too much from the drugstore either but I may give these a try at some point. Yes, I think this one is worth trying if you don't mind the strong fruity scent. The color and the wear are beautiful! I am actually quite glad that the Google+ box broke down. I didn't realize how restrictive it was. Google should know better - forcing us with incompetent products is not the way! Wow... lots of comments on this post haha. I'm not sure I can add anything new to the discussion, but just wanted to say thanks for this review! I recently purchased the Maybelline Color Elixir andddd ... was disappointed by pigmentation. I'm still reasonably satisfied with the purchase, but looks like the L'Oreal Extraordinaire is a better liquid lipstick :) It's on my list now!